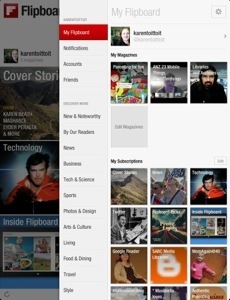 The Storify was made in answer to Thing 14 of ANZ 23 Mobile Things: Curating with Pinterest, Tumblr and Scoop.It. I am a big user of curation in my daily life, and the following points clarify the importance of curation. – I keep up to date with the latest news, research and developments in my professional niche. – I am able to connect with like-minded peers, as well as my community. – I am increasing my social media presence in the niche that I would like to be known in. – It is an activity that should not be neglected, but be part of compulsory duties of every day. If neglected, it will banish you to the “nether regions of lost librarianship”, I’m sure! I love curating on Scoop.It, because it is a very easy way to compile the most recent highlights about a certain topic or field of interest. I have two topics that I am trying to curate on a daily basis. ANZ 23 Mobile Things and Blogging in June put a bit of a damper on my curation, but I will be continuing. I find it extremely valuable for my own professional development! I only noticed recently that the Scoop.It curated posts can be embedded, and will try to see if I can accomplish it in the sidebar as well. Flipboard is such a great reading app for pulling together all your feeds, as well as your timelines from Twitter and Facebook and Tumblr, and all else you can think of. I have Google Reader also feeding here, and apparently it will be save when Google Reader shuts down it’s service in 5 days’ time. It is worth signing up to Flipboard for just this reason alone! The magazines that can be created and personalized by adding stories from all the feeds are a great way organizing topics that you are interested in. 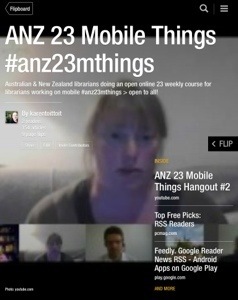 I have made a Flipboard magazine for ANZ 23 Mobile things. It is possible to subscribe to this magazine, and I am able to invite contributors to add to this.